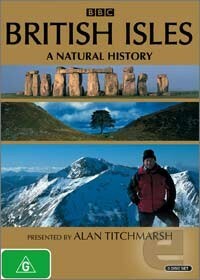 Presented by Alan Titchmarsch, this DVD peels back the years and takes us on a remarkable journey through history. Far from the climate we know today, 'British Isles - A Natural History' reveals the swamps, rainforests, ice ages and volcanos, alongside the civilisations and revolutions that shaped the familiar face of the British Isles. Another amazing documentary series about the history of the British Isles that is presented by the talented Alan Tichmarsch that tells the extraordinary history of how these amazing Isles were formed. Presented in a glorious aspect ratio of 16:9 with Dolby Digital 2.0 stereo that really makes this documentary look amazing on high definition televisions. Unfortunately no special features are included in this DVD series.